My husband had been watching RV ads online out of curiosity, and a 32′ with a really good price tag caught his eye. Initially, I wasn’t overly eager to go see it, because the ad only had pictures of the outside. In my experience, when there’s no pictures of the inside, you need to be weary. Well, I thought I’d humour my husband and go see the RV. It was a really good price, after all. I wasn’t expecting much, but everything changed when I stepped in to this home on wheels. I pretty much made up my mind to buy the RV right after stepping into it for the first time. This 32′ beauty was in excellent shape! The man who previously owned it is no longer able to travel, and figured he’d stop paying to store it and let it go to a new owner. And we’re happy to announce that that’s us! The RV is huge (I call it “the bus”) and beautiful inside and out. There’s tonnes of storage and seating. The sofa opens up into a bed, and there’s good-sized storage under it. K-girl has claimed this bed. The table folds down into a bed as well, and G-boy and M-girl have claimed this bed. There’s storage on both sides, and in one of those compartments are all the attachments for the… wait for it… central vacuum. This thing is fancier than my house! There’s a coffee maker and a kitchen with a double sink, a good size fridge (and freezer), a microwave, stove, and even an oven! The skylight’s cool, too 🙂 There’s another skylight in the shower. In the back, there’s a bedroom with a good size bed (I don’t think it’s a queen, but it feels bigger than a double, so I’m not sure what the size’s called). 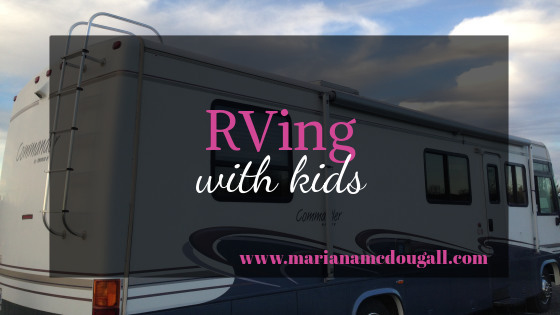 There’s also plenty of storage in the bedroom—and all over the RV too, inside and out. We’re pretty impressed with the amount of storage in here. There’s a small bathroom with a tonne of storage, too. A little shower is also available, as well as an outdoor shower. We figure we won’t be using these much, if at all, but it’s nice to have them there, just in case. We’re really happy with our “bus,” and are looking forward to many road trips. We’re planning many microadventures (and possibly a big one—stay tuned!) in our new house on wheels. It’s a learning process for us, as we’ve never RVd before, but we do love a challenge! I’m also very thankful to the seller for coming to our home and showing us how to summerize the RV, as well as give us tips on how to care for it. Looks wonderful! I know you will have many wonderful adventures! Enjoy!